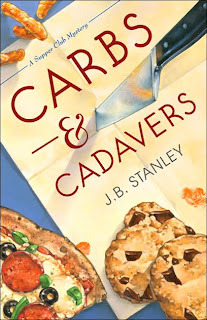 Carbs & Cadavers tells the story of James Henry. At the moment, James' future is looking pretty dim: he's newly divorced; his mother has just died, leaving him to care for his cantakerous father; he's had to resign his professorship at William & Mary and hire on at the library, earning a much lower salary; he's back in his hometown, where he felt awkward even as a child; and, he's 50 pounds overweight. He finds his silver lining in the plus-size form of Lindy Perez, who bustles into the library with a notice to post on the community bulletin board. The poster announces the formation of a Supper Club for people interested in forming friendships and losing weight - "like a dieter's club but more fun," enthuses Lindy. James immediately decides to join the club. Along with Lindy and three others - a statistics-loving postman; a hippie pet groomer; and a sherriff's assistant longing for a promotion - James becomes a member of the Flab Five. With the support of the group, James fully intends to be able to drop some weight. What he doesn't count on is falling for Lucy, whose presence leads directly to his involvement in a murder investigation. The victim is Brinkley Myers, whose only real accomplishments occurred a few years back on the high school football field. No one's all that sorry he's dead, but many are outraged when Whitney, a sweet, young waitress is jailed for the crime. Lucy determines to find the true killer, drawing her dieting friends into her unofficial investigation. As the Flab Five gets closer to the truth, certain members find themselves in increasing danger. Can they prove Whitney's innocence and find the real killer? And, most importantly, can they manage to stay away from Cheese Puffs and peanut butter cups long enough to shed some pounds? I agree, the plot sounds like a lot of fun. In the hands of a better writer, it could have been a decent mystery. But, J.B. Stanley would have flunked a freshman writing course. Her characters are cliched, her writing is sloppy, and the plot she's created is so predictable that I identified the killer as soon as the character was introduced. I had to sit on my hands to stop myself from picking up a red pen and making the book bleed with corrections. If only someone had edited all the clumsy sentences, erased all the extraneous information (the reader really doesn't need a description of every float in the Halloween parade), and encouraged Stanley to flesh out her characters, this book could have worked. As it is, Carbs & Cadavers is nothing more than a rough draft. Perhaps the book could have been redeemed by some interesting recipes, but nope. It includes only two, and if you've ever tried to lose weight, you've seen them both - "Phony" Mashed Potatoes made with cauliflower; and crustless pumpkin pie. Neither look that great. Have you tried Karen Macinerney's Grey Whale Inn mysteries? There are two, "Murder on the Rocks" and "Dead and Berried". She has some delicious recipes in them (one of our library book group members made the chocolate chip cookie recipe and brought it to a meeting) and I thought the mysteries were fun. Set in Maine but Karen lives in my hometown. I haven't heard of these, but I'm going to give them a try for the 888 Reading Challenge (I'm working on a post about it now). Thanks for recommending them to me!